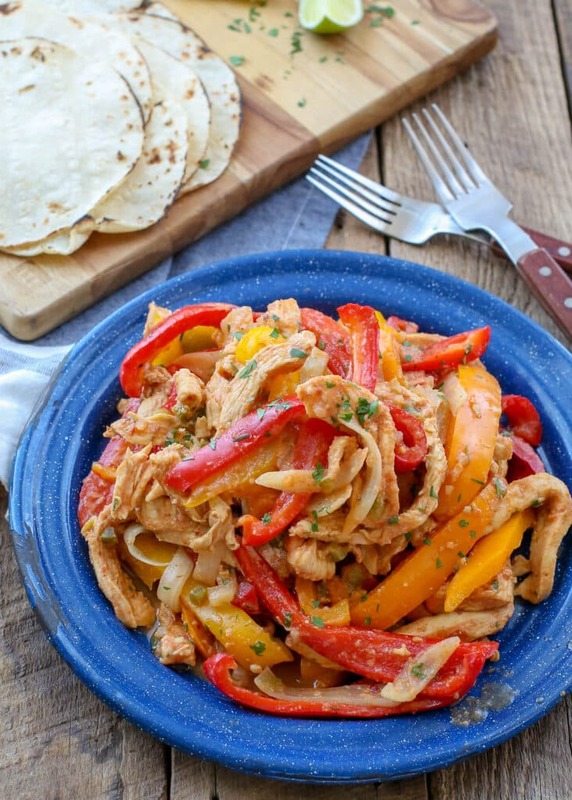 Spicy strips of chicken, bell peppers, and onion are cooked together in this oh so easy crock-pot recipe for Chicken Fajitas. 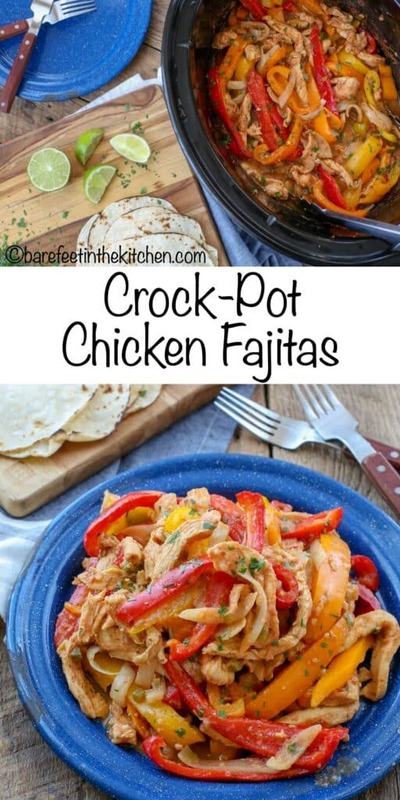 Crockpot Chicken Fajitas are a meal that you can start in the afternoon and they’ll be ready by the time everyone is hungry in the evening. Most of you have gathered by now that my family is a big fan of Mexican inspired meals. We use Mexican spices constantly and eat some version of a southwest, Tex-Mex or Mexican food a few times a week. Very much like the Slow Cooked Chili Steak Fajitas I posted last year, these fajitas are full of heat and packed with that southwestern flavor I crave. The liquids in the base of the crock-pot form a fantastic sauce by the end of the cooking time. I also love how pleasing the orange, green and red bell-peppers look when cooked and served in the chicken. This is one of those easy recipes that takes very little effort but looks as good as it tastes. I’ve made these Chicken Fajitas many times and served them wrapped in tortillas. They’re also delicious as Chicken Fajita Bowls served over rice. The best part about Crockpot Chicken Fajitas is that they cook in just a couple hours. I love a recipe that you can prep in the morning and enjoy the smell of all day long but sometimes my schedule just doesn’t allow me to prep that far in advance. With this recipe, I just slice everything up, toss the meat with spices, onions, and jalapenos in the slow cooker, let it cook a couple hours and add the peppers toward the end of the cooking process. It’s THAT easy to have perfect homemade fajitas for dinner. 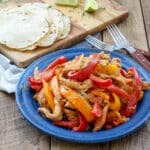 Fajitas are traditionally made by grilling meat but I find I enjoy slow cooker chicken fajitas just as much. They also have the added benefit of not needing any of my attention at all when they cook! I almost hesitate to call this a true “slow cooked” recipe because the chicken doesn’t take long as all to cook. The whole meal is ready to serve in just about two hours! This is fabulous when hunger levels are high and patience levels are low or on those days when you had every intention of getting a slow cooker meal together in the morning but it just didn’t happen. With Crockpot Chicken Fajitas, I can look like I planned everything in advance when in reality all I did was throw a bunch of ingredients in a crock-pot at 3 o’clock. I like to serve these chicken fajitas on their own, wrapped in tortillas, or over rice. These fajitas have a lovely spicy kick to them. The chicken is seasoned with your favorite Mexican spice blend. I use my beloved Homemade Taco Seasoning which contains, among other things, plenty of cumin, paprika and chili powder. The rest of the heat comes from the jalapenos and salsa added to the pot before it all cooks together. I’ve made this recipe with both homemade salsa and the jarred stuff from the grocery store and both ways work well. Choose a salsa that suits your family’s level of spice tolerance. I opt for a salsa with a medium heat level since the japalenos, peppers and taco seasoning also give the chicken a little kick. First, I recommend reducing the chili powder and jalapeno peppers in this recipe to suit your spice tolerance level. Cutting the amounts in half is a good starting point. 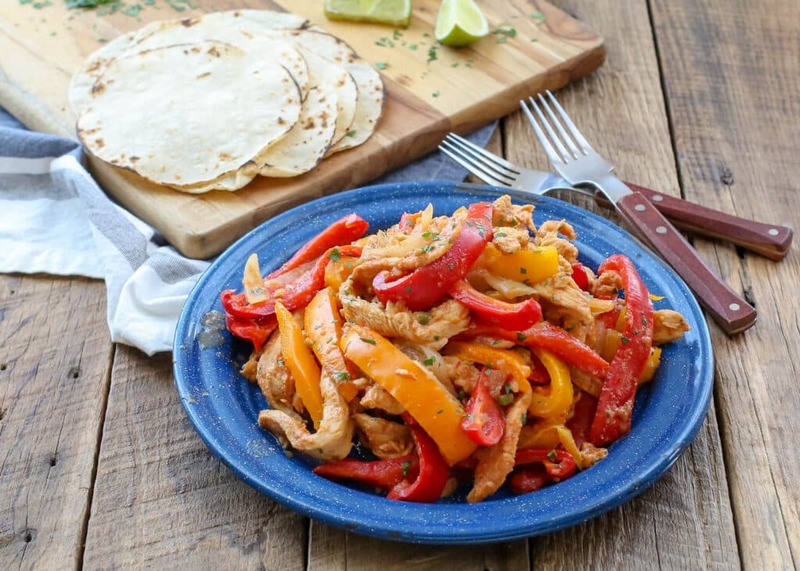 If you can’t handle almost any heat at all, I recommend trying these Chicken Fajitas. They are every bit as delicious, but without the spicy kick. In my house, no one complains one iota about the spice level in this Fajita Recipe. It’s just enough to delight our taste buds without being so spicy that we’re gulping down gallons of water with our meals. Slow Cooker Chicken Fajitas are easy enough for a busy weeknight dinner and festive enough to serve at a big family meal on the weekend. Serve with a side of Spanish Rice and Refried Beans for a fun Tex-Mex feast. For more great Crock-pot dinners, check out Slow Cooker Beef Stroganoff, Slow Cooker Potato Soup, and this Sweet and Tangy Pulled Pork. This Crockpot Chicken and Rice and this Crockpot Pizza Casserole are both terrific dinner options as well. Place the onion and the chicken in the bottom of the crock-pot and set the crockpot it to LOW. Mix together the salsa, lime juice, jalapeno, garlic and the spices. Pour over the chicken and onions and toss to coat. Cover with the lid and cook for 1 – 1 1/2 hours. When the chicken is mostly cooked through, add the bell peppers and toss to combine. Cook for an additional hour. These fajitas are full of heat and packed with southwestern flavor. Place the onion and the chicken in the bottom of the crockpot and set the crockpot it to LOW. Mix together the salsa, lime juice, jalapeno, garlic and the spices. Pour over the chicken and onions and toss to coat. Cover with the lid and cook for 1 - 1 1/2 hours. When the chicken is mostly cooked through, add the bell peppers and toss to combine. Cook for an additional hour. If desired, remove the lid after an hour and let the sauce thicken without the lid for another 30 minutes. You can also drain most of the liquid into a small saucepan and reduce it over medium heat if you prefer. Enjoy! FREEZER MEAL: Prep all ingredients and combine everything (except the bell peppers) in a freezer safe gallon size Ziploc. Place the peppers in a separate freezer bag. Freeze until ready to use. Thaw the chicken mixture in the refrigerator overnight before cooking as directed above. Add the bell peppers to the Crock-pot while still frozen. I don't know what else to say except... YUM!!! I agree Yum!! Looks so delicious!! Gotta love an easy peasy delicious weeknight meal like this! I adore chicken fajitas so this is going in my pile of must-make recipes that belong to Mary. I think I should retire from blogging so I can just make all your delicious recipes. Can't wait to try the taco seasoning mix too. I think I'll use extra onions - yum! The cockpot sure turns fajitas into a nice one-pot meal. I never make fajitas, and my crock pot has been getting dusty lately, so I need to make this. I love the idea of the salsa creating the sauce. enjoy with rice or bread sure yummy! I am a HUGE fan of fajitas of all kinds, grilled, crock pot, chicken, steak, you name it! Hi, I enjoy your site and found it through Pinterest. One hiccup I've noticed is that when I print recipes the "freezer" section doesn't show up on the print page...thanks for sharing your delicious recipes! just a question... do you add the frozen bell peppers at the beginning or at the normal lapsed time? The frozen peppers go in as directed in the recipe. They will thaw very quickly. Hope that helps! I like the sound of this. Pinned it! The peppers will only be frozen if you are following the Freezer Meal directions. :) They go in when the chicken is almost cooked with both methods. enjoy! I missed you Mexican Seasoning Mix,/Fajita Seasoning Mix . May I have it, please? Thanks. Here you go: https://barefeetinthekitchen.com/homemade-taco-seasoning/ Enjoy!